Quick Review: Everything in Arabelle's life is coming together. She has confidence, great friends, she's even dating Naak, a wealthy Thai socialite. But there are too many models in Bangkok. Arabelle’s broke, she can’t find an agent in New York, and Naak isn’t as wonderful as he first appears. Slowly the Shadows creep back into Arabelle’s mind, bringing with them thoughts of hopelessness and despair. The vile Shadows know something Arabelle’s refusing to remember and, if she’s not careful, they’ll use it to destroy her. 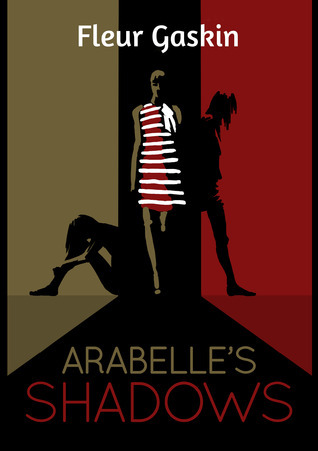 Based on a true story, Arabelle’s Shadows takes us on a journey through the struggles of growing up, not quite making it as an international model, and attempting to overcome a crushing depression. Detailed Review: I must say I wasn't immediately pulled into the story but I am still going to give it a high rating. Why? This book is different than others in so many ways. The story, the concept, the descriptions, they felt like they were coming from a different life and world. What I think made me impressed was the author's ability to describe the simplest feelings like love and depression. And also, it feels real, and I think it reflects the author's life as a model before she wrote this book. Not many books can give me this feeling of reality because they were simply too perfect or too simple. Every diary I’ve ever written has been sad. It seems I only ever write when I’m depressed or overwhelmed or some bad thing has happened. Not this time though. This diary’s going to be happy! Arabelle has finally managed to escape her family and home in New Zealand, where problems have been plaguing her. She intends to become an actress, but decides to become an international model for more exposure towards the entertainment industry. In her career, she visited many countries such as Thailand, France, Malaysia, South Korea and Greece. Now and then, the Shadows come and urge her into surrendering to them, but everyday she fights a battle with them where a stalemate is always reached. She believes in not losing to them. She believes in life. She has always been a sensitive person, when someone near her gets hurt, she would also shoulder the very same feelings the person is experiencing, causing her to develop a depression since she was young. I was actually flattered by how Kuala Lumpur was described with positive remarks. It's great if somebody thinks the place you stay in is good. Brief Review: This book is beautiful and has its flaws, but doesn't every person have his or her flaws too? The book was a really great experience and I'm glad that I decided to agree in reviewing it. It makes us believe that we have the right to have our own life and not let negativity take over. This will give people another perspective of life where nothing is perfect but sheer determination will always help you overcome.